SoundCloud Pulse lets you manage your account, check your stats and reply to comments, whether you're in the studio, on the tour bus, or just away from your desktop. 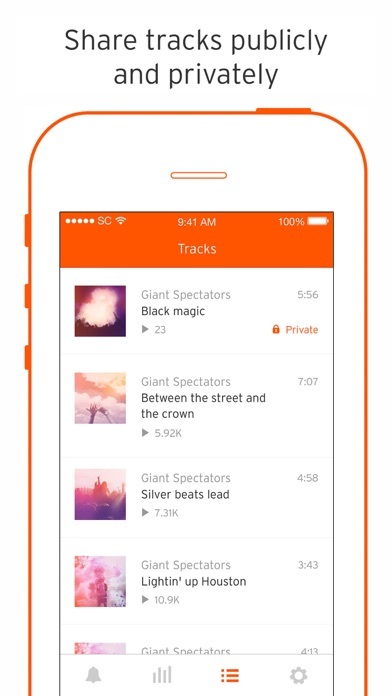 Key Features - Reply to comments on your tracks, on the go - Get up-to-date stats on the performance of your tracks - Edit your track details and toggle privacy settings on mobile - Share the sounds you’ve uploaded, both publicly and privately - Follow other users You’ll need a SoundCloud account to access SoundCloud Pulse. Don’t have one yet? 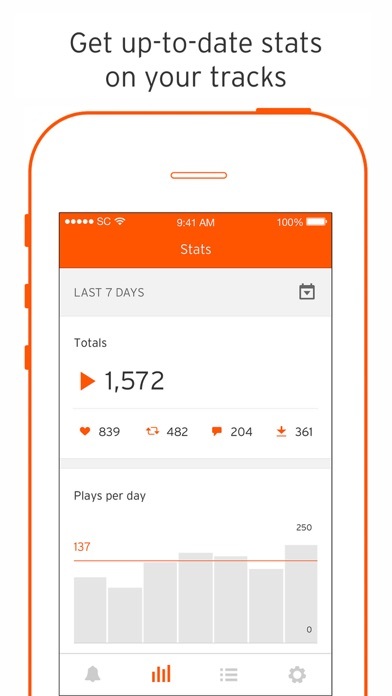 Download the SoundCloud app (https://itunes.apple.com/us/app/soundcloud-music-audio/id336353151?mt=8) or go to SoundCloud.com to create one. 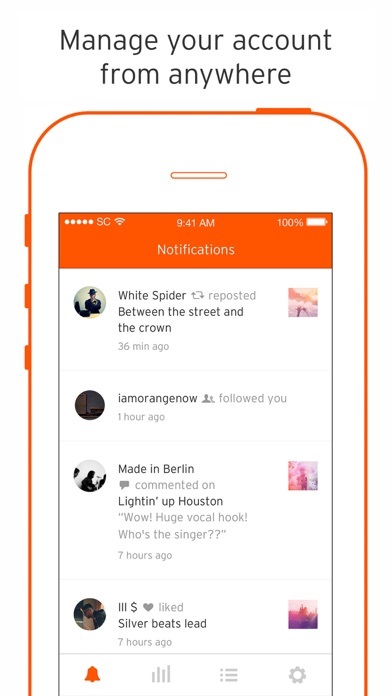 COMMUNITY Want to learn more about SoundCloud’s community of creators? Find us at our blog and on social media. - SoundCloud Blog: http://blog.soundcloud.com - Facebook: http://www.facebook.com/soundcloud - Twitter: https://www.twitter.com/soundcloud - Tumblr: http://soundcloud.tumblr.com - Instagram: http://instagram.com/soundcloud PROBLEMS? FEEDBACK? 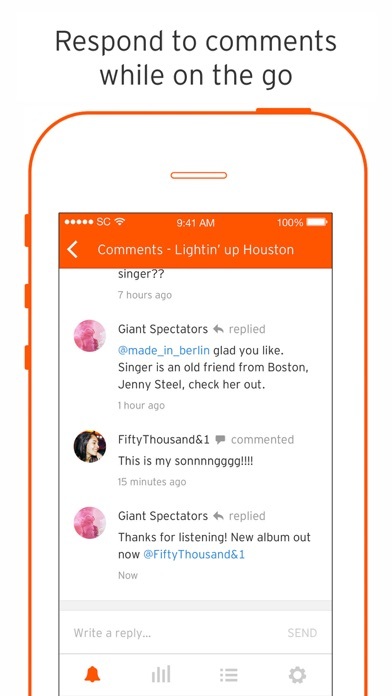 The more you tell us, the better SoundCloud gets. - http://help.soundcloud.com - https://twitter.com/SCsupport PERMISSIONS Your privacy is really important to us. We only ask for the permissions we need for the app to be at its best. Everything seems pretty good but HOW DO I UPLOAD TRACKS. I go to upload beats I go to SoundCloud pulse the beat isn’t there!!!!! 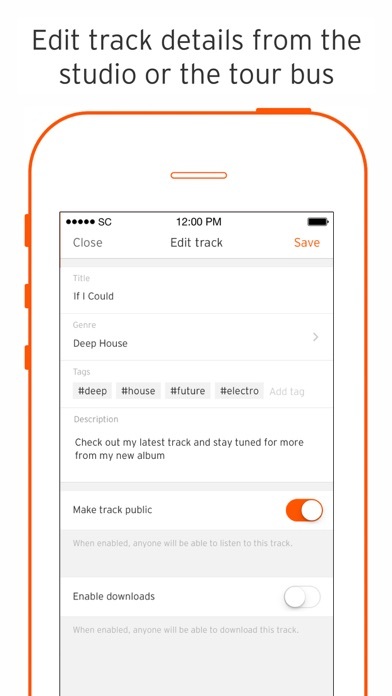 Make it easier to upload tracks or show us a way to. I waited a week to see what tracks I play the most and after a week I go into the app to see my Soundcloud stats and nothing was there. The app doesn’t even do what’s its supposed to do smh just delete this off of the App Store. I downloaded this app so I would be able to interact with my followers and edit my page. This app does neither of those things. I can see insights, but if I want to thank someone for following me or liking a track I am unable to do so. Furthermore, I cannot edit the photo on a track nor edit any of the information. This app is pointless. I do not care about insights. I care about my music and interacting with my fans. Fix!!! To be honest, when I saw this app I thought it would help update your profile because that is the whole reason why I downloaded it. There’s really nothing to it, it’s just notifications and other stuff. Please don’t get mad at me (this is just an opinion) I think it would be better if you could edit your profile on this app. Need to make SoundCloud & SoundCloud Pulse to where you can change pictures on a phone & not just a desktop, other than that. Great app to look at your statistics.